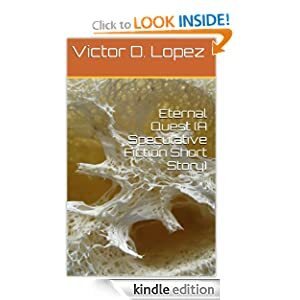 Eternal Quest free from Amazon Monday Sept. 15, 2013 | Victor D. López, J.D., Esq. Eternal Quest is one of my first short stories, written when I was 19 for a fiction class in college along with some others that have been lost over the years. Although I’ve lightly reworked it over the intervening thirty years or so, it is largely as I first wrote it and is still my personal favorite among my short fiction. I don’t think I’ve written anything better since then–a hard, sad thing for an author to admit. But I am perfectly happy if I never do as I truly like this story which still reflects more than a little of my own neo-Platonist philosophy and romantic core. It is about sacrifices made for love and friendship too deep for words to describe that can make even unrequited love bearable, about putting the needs of others above our known, about the mindless pursuit of answers in all the wrong places and about lessons learned in life much too late for solace, comfort or salvation. But it is also about much more than existentialist despair or the irony of a wasted life. Ultimate it is about friendship, about the need to balance what Plato called the Appetites, Reason and the Spirited Element in each of our own lives (what Freud later “borrowed” and renamed the Id, Ego and Superego). More than anything, it is is about transformational friendship and its ability, for those of us lucky enough to experience it, to make us far stronger than we could ever be without the balance it can being to our lives.I blush to admit this, but more than thirty years after writing this story, I still tear up when I read it to the end. The personal subtext is not important, then or now, but the knowledge that there is no greater truth we can learn during our short sojourn through life than that which is taught only by pure, unselfish, love–requited or not–is essential. As is the transformative power of true friendship. I have learned nothing of greater importance since writing this story, and I never will.